This weekend you’ll be pleased to know I have been reading the recently released update of the OXIS survey (which you can get hold of here – but large thanks to Tim Davies for posting me a copy!). I have also been updating my Facts Glorious Facts page if you like that kind of thing so this post is really just a few highlights and observations from the report. For those of you who haven’t come across it the Oxford Internet Survey is the UK answer to the Pew report and consists of a questionnaire sent to a weighted sample of 2057 people on the UK (response rate is just less that 50% which isn’t bad). 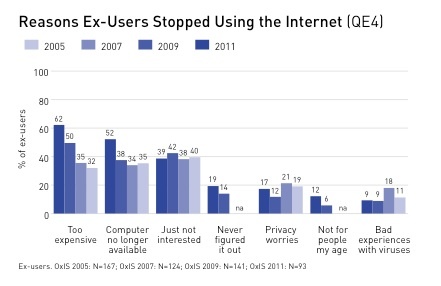 Its not huge but its an excellent summary of where we are as a country with respect to internet usage and as this is now the 5th year (its been running avery other year since 2003) it is now a good source of longitudinal data about internet habits. The interesting thing is that these are not just “The Young People” (have started capitalising this since turning 40) – there is a stronger correlation with income and employment – though students are a large part of this new group. 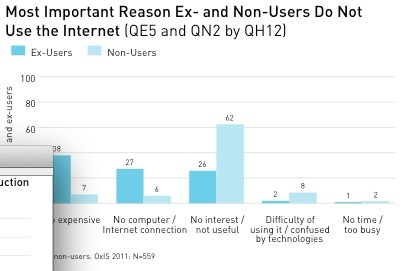 Given the fact that reasons for not using the internet are closely linked to the costs as well as the access to technology that is driving this next generation use then I for one will be watching very carefully to see whether or not increased market penetration of smart phones and cheaper tablets starts to change this picture. 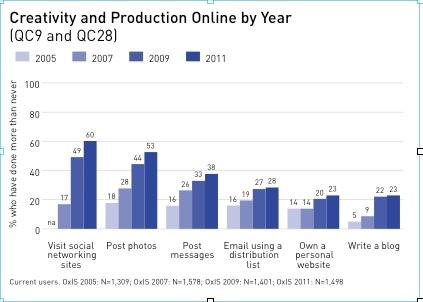 Overall the use of social networking sites has moved from a minority position in 2009 to a majority activity (60%) in 2011. Importantly schooling is not important to the use of these sites – but as we saw earlier income is. 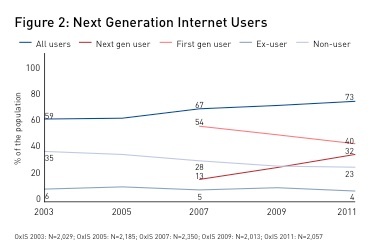 Overall the levels of participation with government and democracy indicated by the report are small – and though the next generation of users are more active this is as likely to correlate with the fact that they tend towards a higher income than specifically being linked to their next generation use – if indeed you can separate this at all. Political efficacy is shown to be positively associated with internet use but there has been no significant increase in online political participation evidenced by the research desipte the 2010 election having been held since the last survey in 2009. Civic participation is also not huge (NB they use a difference definition of civic to the one I use and are talking about participation in non-political associations rather than the wider desire to connect to your community with or without formal organisations). Given the levels of disatisfaction with the political process and the results from for example the Hansard Audit these findings should not suprise us – though they should be of some concern. It would be interesting to see what the results would be if the questions explored membership of online campaigning movements such as Avaaz or other online campaigns such as ‘Hugh’s Fish Fight” – are we really these low levels of participation or are we seeing them specifically with respect to the formal political process? The report is detailed and I recommend having a read. The entry point of the nature of your access as a way of codifying your relationship with the internet is a useful one and the next generation internet category is a good way of exploring the differences in internet use that we see. I would like to see more exploration of which came first – the behaviours or the devices but we probably have to accept that they drive each other. The nature of the digital divide is clearly changing and with respect to my work I think we need to be even more conscious than ever that the people we see creating content and demonstrating their political efficacy are a fairly specific group. The good news is that if you can give people access then indications are that there are few barriers to them participating – but the question is whether or not enough people will get smart phones for Christmas in order to start changing this picture. I am reading the brilliant “Amusing ourselves to death” at the moment and I must say that we have to ask whether or not the passive entertainment that the television has provided us is going to be a bit of a blip with respect to how we chose to spend our leisure time – ask me again in 2050. Within this section there is some important stuff about levels of trust in different media and organizations (sorry government – last again here with trust levels being between 2.5-2.3 out of 5). This is a more in the way of a note to self hence the late addition. 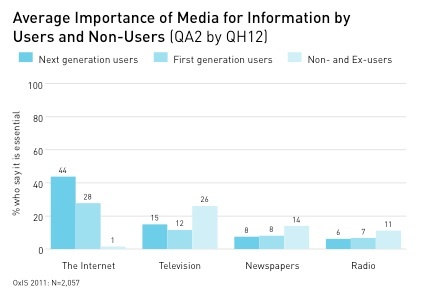 Throughout this report the authors have spoken about respondents ‘using social networking sites’ – but the fact is that according to the OFCOM data this really means using Facebook for the vast majority of people. It may not be the case for the content creators who make wider use of social media services (we have found it around 50:50 with the social media audits) but we need to be careful I think about whether or not we are seeing one successful service – Facebook – as opposed to a general trend. 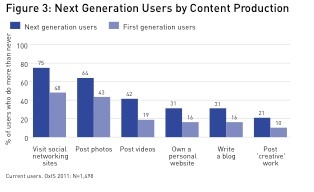 My personal view is that we are seeing a general trend and that the next generation users are embedding the social web in their lives in lots of different ways but the overall growth may be less that these stats show as Facebook take up is masking other kinds of behaviours.